Just to let any potential readers know that After Photography has just been released by W. W. Norton in paperback in an English-language edition, and soon there will be translations published in Chinese, French, Korean and Spanish. I am certainly heartened by the many comments I have received from readers of the book since it was first distributed in hardcover some 15 months ago, and a number of reviews in the general press. I hope still that it will spark more discussion in the photography, journalism and art communities. If there was ever a time to think about how photography should be evolving, this is the moment. This was written by fredritchin. Posted on Wednesday, March 3, 2010, at 10:48 am. Filed under Uncategorized. Bookmark the permalink. Follow comments here with the RSS feed. Post a comment or leave a trackback. 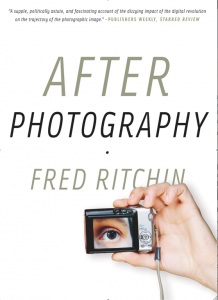 Fred, After Photography is a remarkable book that challenges not only photographers but “image makers” to evolve a new media into new horizons, beautiful examples to illustrate main concerns about reality, truth and perception. I am very keen on this book, and am recommending it to everyone, from those who are fighting against the digital and those who, like me, embrace it but are worried about how to use it. An excellent book that will stay in use for a long long time.